University tuition fees have jumped an average of 3.1 per cent for undergraduate programs for the 2017-2018 academic year, according to Statistics Canada. Average undergraduate tuition for university students climbed by 3.1 per cent this academic year, according to Statistics Canada data released Wednesday. The average tuition has increased to $6,571, with the cost depending on what program a student is enrolled in, from $6,375 in the 2016-2017 school year. 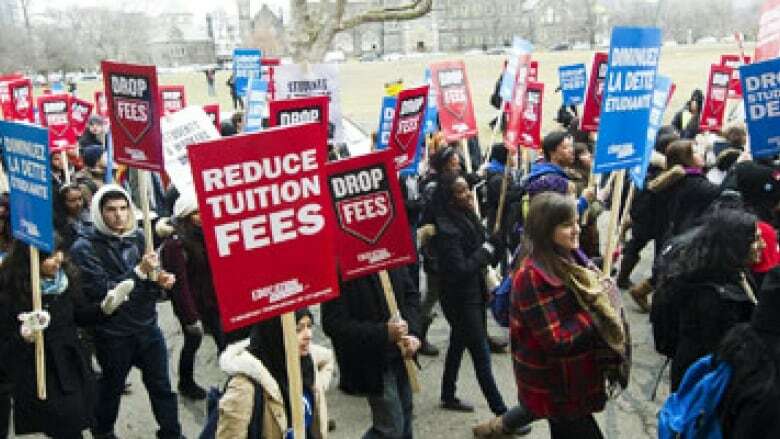 Charlotte Kiddell, deputy chair of the Canadian Federation of Students, said rising tuition costs deny access to many lower-income Canadians, including those from Indigenous communities, and leave others with "mortgage-sized" debt. "When post-secondary education is essential to pursue a decent quality of life, it's absurd that people should be denied that opportunity based on costs," she told CBC News. "Seventy per cent of new jobs in Canada require some form of post-secondary education and it is perpetuating a cycle of poverty to prevent the most marginalized in our communities from accessing education that should be a right." Kiddell said Canada should have a federal oversight and regulation system with dedicated federal transfers to the provinces for post-secondary education, similar to the model for health care. She said it has been disappointing that Prime Minister Justin Trudeau, who is also minister for youth, has not backed up his talk with action. "Our prime minister talks a lot about universal accessibility, but the government hasn't actually taken any steps to make that a reality," she said. "They certainly have increased some funding to student grants and forms of student aid, but that kind of piecemeal reform will not be enough to address what is a crisis in post-secondary education in this country." Mathematics, computer and information sciences: $7,140. Business, management and public administration: $7,068. Health, parks, recreation and fitness: $6,261. For graduate students, the average tuition is $6,907, a 1.8 per cent increase from the previous year, when it was $6,784. At the graduate level, students in the executive (EMBA) and regular masters of business administration (MBA) programs pay the most on average: $51,891 for an EMBA and $29,293 for an MBA. Tuition for international undergraduate students jumped by 6.3 per cent to $25,180 last year, while fees for graduate programs increased 5.4 per cent to $16,252. Two-thirds of international students were studying at the undergraduate level in 2017-2018, and almost a third of them were enrolled in business, management and public administration programs. Another 14 per cent of international undergraduate students were studying engineering, which had above-average tuition fees of $28,625. While universities receive the majority of revenue from government funding, tuition fees represent a growing source of cash. Michael McDonald, executive director of the Canadian Alliance of Student Associations, said universities and students have faced intense cost pressures since the 1990s, when social program spending was slashed at the federal level. He said it is imperative that students receive supports not only for tuition but for food and housing. While some provinces like Ontario and New Brunswick have adopted financial supports for lower-income families, there should be national baseline standards to guarantee access for all students. McDonald said increased federal transfers to the provinces would also increase contributions to universities, which are facing significant costs for modernized, competitive infrastructure and high-technology programming. "We do think there's a clear place where the federal government can take a more active role in this," he said. The increase in the average for undergraduate tuition fees this year ranged from 0.1 per cent in Alberta to 5.5 per cent in Nova Scotia. Tuition fees for Canadian graduate students were unchanged in Alberta and Newfoundland and Labrador, but rose in all other provinces, from 0.8 per cent in British Columbia to 2.8 per cent in Nova Scotia.